The UK Guitar Show 2018 is set to get underway later this year. 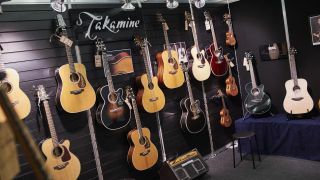 The ultimate event celebrating all things guitar related will take place at London’s Olympia on September 29 & 30 and is brought to you by the organisers of the London Drum Show and the London Bass Guitar Show and in association with MusicRadar, Guitarist, Total Guitar and Guitar Techniques. Visitors to the two-day event will be able to enjoy a range of activities, performances and masterclasses – led by some of the world’s finest guitarists. There will be a main stage featuring a variety of musicians showing off their skills, acoustic workshops, the Gear Hall where you’ll be able to try out and buy the latest guitars, a Guitar Garage where experts will be on hand to give your instruments some TLC and the Vintage Zone, featuring rarities from top collectors and retailers. There will also be Tuition Clinics, with free lessons from top tutors for all ages and abilities and the Guitarist Of The Year finals, which will shine a light on the world’s best amateur guitarists and give players the opportunity to show off their skills to a panel of judges. The first artist confirmed for the weekend is Irishman Simon McBride, who will play with drummer Marty McCloskey and bassist Dave Marks. The Simon McBride Band will take to the stage at 1pm on the 30th. Further artists will be announced in due course, while early bird tickets for The UK Guitar Show 2018 are available until midnight on Saturday, July 7. For more information, visit the official UK Guitar Show 2018 website.